Interview: Veteran Chicago actor says playing a popular but emotionally paralyzed English teacher in David Read West’s “The Dream of the Burning Boy” demanded deep-level honesty. At Profiles Theatre through April 28. The central character Larry, an English teacher, in David West Read’s “The Dream of the Burning Boy,” is a smart, inspiring mentor to the kids around him. But when they need him as consoling father-figure, after one of their classmates dies, Larry can’t engage their pain or embrace them emotionally. 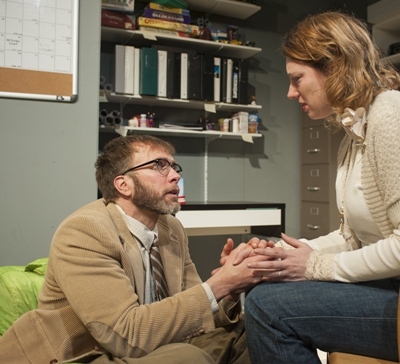 For Darrell W. Cox, who delivers a wrenching portrait of the teacher at Profiles Theatre, such a closed-off, deeply complicated soul is the touchstone of great drama. 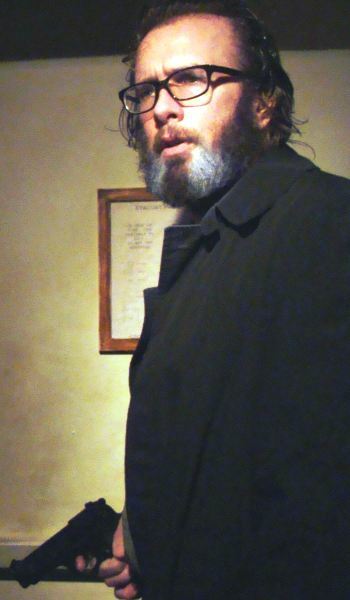 Cox, a member of the Profiles ensemble since shortly after his arrival in Chicago from his native Texas in 1989, is one of the city’s most visible actors. He carved a reputation at playing hard-bitten, rough-edged types from the title character in Tracy Letts’ “Killer Joe” to the obsessive kook (at right) searching for his severed hand in Martin McDonagh’s “A Behanding in Spokane.” Cox says this teacher, with his emotions all buttoned up, suits him better now. The deep-level suffering of the English teacher rises to the surface, Cox notes, when he’s badgered by his friend Steve (Eric Burgher), the high school counselor, to reach out to the distraught kids. For that matter, the teacher is also confronted by one of his students (Alaina Stacey), the dead boy’s sister. “He begins to get a sense of how shut down and paralyzed he is,” says Cox. 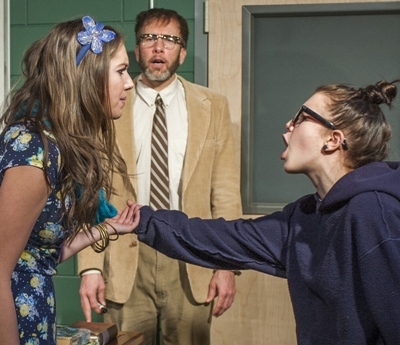 The teacher’s process of self-discovery is, in effect, a difficult and volatile rebirth, played out with harrowing intensity in the up-close confines of Profiles’ 60-seat Alley Theatre. It works so convincingly, says Cox, only because the players who are in each other’s faces share personal as well as professional confidence. It starts with Eric Burgher’s relentless counselor Steve, determined to help the teacher connect with himself – and thereby open up to the needy students. (Click here to see the video pictured at right, when Steve pushes Larry to talk about the tragedy.) Burgher and Cox, both ensemble members at Profiles, have gone down many a dramatic path together. But new in the mix are Alaina Stacey, an actual high school student, and 19-year-old Marilyn Bass, who plays the pretty, popular Chelsea. “You’re sharing a lot of yourself in a play like this,” says Cox. “The fights on stage, so vicious and brutal – that only happens when you really trust each other. You have to love each other and feel safe. You hold things back when you don’t feel safe. It’s really something to watch the rage Alaina unleashes at Marilyn, but off-stage they’re the sweetest people. The referee and perhaps guardian angel in all this is director Joe Jahraus, the founding artistic director of Profiles. Last year, Cox assumed the title of co-artistic director.